Reading is UNdead! Everyone has zombies on the brain as Stink's school and a local bookshop cook up a frightfully fun Main Street event. Guts! Brains! Eyeballs! There's only one week before the new book in the Nightmare on Zombie Street series comes out. Of corpse Stink will be first in line at the Blue Frog Bookstore to buy his copy and join the town's Midnight Zombie Walk! Until then, Stink and his friends keep busy making ketchup-stained zombie costumes, trying to raise money to buy the book and racking up points for Virginia Dare School's race to one million minutes of reading. 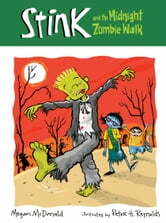 But with all that talk about the undead, Zink – that is, Stink – starts to wonder: is he being hunted by zombies? He does have a very delicious – er, superb – brain, after all. Readers will just have to open ze book and zee! Mwa ha ha ha!